Minibike pumps might not be used that often, but when you need them, you need them. They’re a vital bit of kit for when you’re out cycling and need to inflate your tires. Because of this, they need to combine size with maximum efficiency. 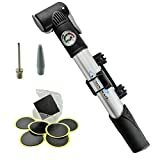 The ideal mini pump is lightweight and compact while also managing to inflate your tires without taking you too long to do it. To be effective, they need a robust and clever design. Minibike pumps come in a variety of shapes, sizes, weights, and costs: it’s up to you what you’re looking for. 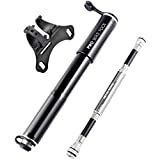 Below, we’ve compared some of the best mini bike pumps and listed their standout features so that you can make the best choice for you and your riding. This is a great lightweight piece of kit made from 6061 Grade Aluminum. It has a neat ‘Super Fit Clever Valve’ which fits both Presta and Schrader valves so you can take it with you whether you’re riding your mountain or your road bike. 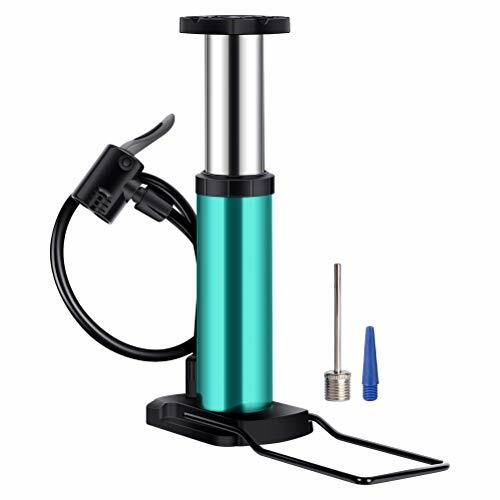 In addition, it has two pumping modes where you can either get air quickly into the tire or pump more slowly, towards the end, to get your wheel up to 120 PSI. The kit also comes with a glue-less emergency puncture kit so that you can easily repair a puncture while you’re on the go and re-inflate! 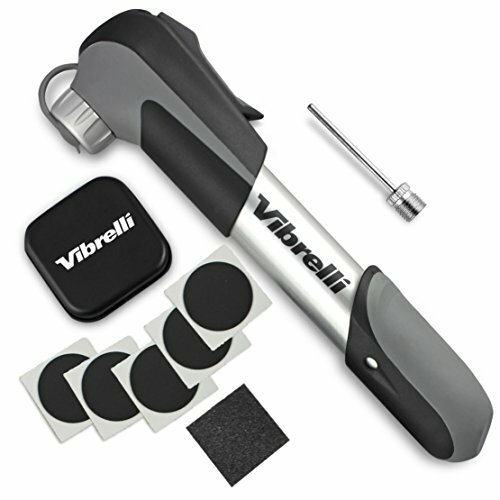 Why We Like It – The Vibrelli mini pump is excellent for taking on touring and for use on multiple bikes. It is good value and made with good materials, meaning it is built to last. This pump is a little bit different, intended for foot-operation. It lets you use the strength of your legs to quickly inflate your tires to your desired pressure. While it may be a little bit bulkier than some other mini pumps available, this feature certainly comes in handy. It comes with a clever design that allows you to balance the pump with one foot while pumping with the other. The base has a non-slip coating to stop it from falling over when pumping. In addition to all this, it is certainly small enough to carry on any adventure with you. Why We Like It – This pump is extremely neat, combining the utility of a foot-pump with the portability of a mini hand pump. It works really well and offers excellent value for money. It’ll have you going in no time. The Lumintrail mini pump is very good value. It has a built-in pressure gauge so you can see exactly how much you need to keep pumping while on the roadside. In addition, it had a composite telescopic barrel saving on space without compromising on the pumping action. The composite design means that each pump gets more air into the tire, saving time when you pump. There is also a rotating head which means that it is easy to use when your valve is in an awkward place. 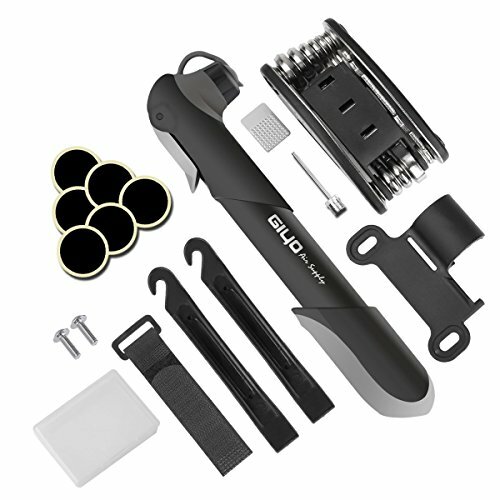 The kit includes a mounting bracket for attaching it to your bike. Why We Like It – The Lumintrail pump offers very good value for money, offering lots of great features without breaking the bank. The built-in gauge means you have a good sense of how much more air your tire needs. The Pro Bike Tool comes with a space-saving piece of composite design. It comes with a flexible hose which attaches to the valve on your wheel. The hose fits inside the pump itself, saving space in a single, neat design. The hose means you can pump from an easier position and get more air into your wheel. It is also built with an oversized piston design which claims to be able to inflate your tires with 30% fewer strokes. The pump is made with premium materials and comes at a slightly higher price but the quality is worth the investment. It’s a very good looking design that fits both Presta and Schrader valves. Why We Like It – This is a beautifully designed and extremely functional mini pump. It is of high quality and built to last. The built-in flexible hose means that you get the functionality of a larger pump without the size. This pump comes with an almost complete repair set. It is a 16 in 1 repair set with various sizes of a hex wrench, Phillips screwdriver, spoke wrench, and more. The pump itself had a Velcro mount to quickly fix it to your bike. It is compatible with Presta and Schrader valves and has an effective seal, preventing air leaks, which allows pressures up to 120 PSI. Being made from an aluminum alloy and environmental plastic, it is lightweight and durable. The full kit means that you can repair most bike faults and get back on the road quickly. Why We Like It – An excellent value pump that comes with a lot of extra repair tools. The mini pump and repair set will allow you to fix your bike quickly. The pump is lightweight and can be mounted easily to your bike with the Velcro mount. A compact but very effective mini floor pump. Like the Veeca pump, it is more of a leg pump than a hand pump. This means it is often easier to get your tires up to high pressure. It’s very lightweight and is made from an aluminum alloy. The pump has activated inflating, which saves on the effort. In addition, it has a short but flexible hose to connect it to the valve and a surprisingly wide chamber, meaning fewer strokes to get your tires up to pressure. The manufacturer also offers a 12-month warranty in case you’re unsatisfied with the product. Why We Like It – It’s a great value and a powerful floor pump. It is portable and can be used in any weather. It will fill your tires quickly and let you get back in the saddle in no time. Another foot pump which has a powerful piston and attractive design. It has a slightly longer barrel than the other two foot pumps listed. This means that each pump delivers more air to your tire. Despite this additional length, it is very lightweight and can easily be stored in a bag or bike pannier. 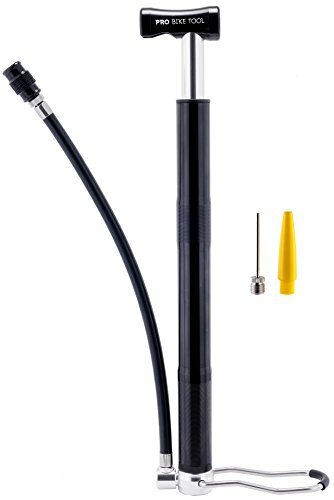 The Pro Bike pump has a T-shaped handle design that can be operated by hand or by foot. It is made from high-quality materials and is certainly built for durability. It can be mounted to a bike frame with the appropriate fittings (mount included). Why We Like It – Maybe the most efficient foot pump we’re listing. It could double as your home pump because of the additional chamber length. In spite of this, it is still a very lightweight pump. 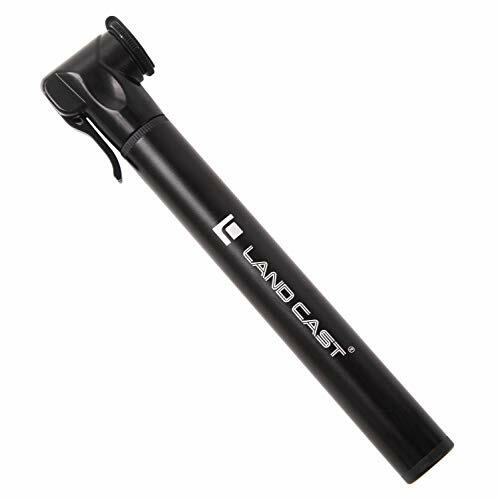 The LAND CAST pump includes double chamber technology which claims to be able to achieve pressures of 300 PSI. Apparently, this pump would be suitable for your motorbike. The design uses 6603 aluminum alloy, giving strength without adding additional weight. Additionally, it has a stylish design that is the icing on an excellent product. At the top of the pump is a very strong valve bike lock system which prevents any air leakage during the pumping. Why We Like It – It has an innovative design which makes it a very efficient and useful pump. It comes with a neat case that will keep it protected inside a backpack. Topeak is a recognized brand in the cycling world for a reason. This pump is made from very high-quality materials and components and had been tested to ensure it’s durability. It has a handle which folds ergonomically to 90 degrees, meaning you can push harder on to it. The pump has up to 160 PSI. 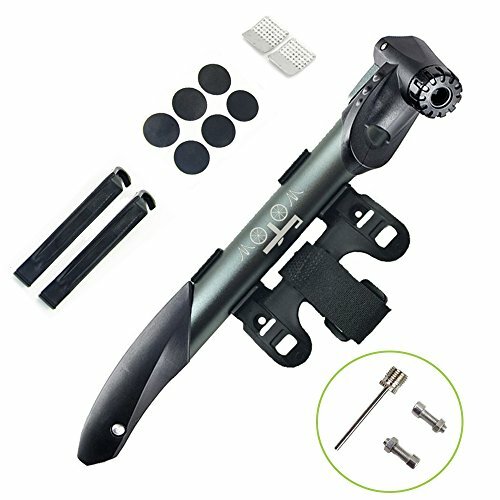 In addition, it comes with a sturdy bracket that can be fixed to your bike to the make sure that your pump is always on hand. The innovative design means that it saves on space and weight. Why We Like It – When you buy Topeak you know, you’re buying quality. This is a great mini pump that is built with excellent materials. It will last you many cycling adventures. The Wotow pump has a double-inlet. This means that it inflates your tire when you push in and when you push out, saving you some effort. Again, it has a fold-out T-shaped handle which allows for more ergonomic pumping action. The pump is made from a high-quality metallic texture aluminum alloy, guaranteeing a good build standard. The kit includes pry bars, glueless tire repair patches and a bike frame mount for the pump. Why We Like It – This is a great little kit for someone who has just started to take their cycling more seriously. It’s good value and comes with plenty of extras, including an easy fitting Velcro mount. Mini pumps shouldn’t really be replacing your floor pump. Their smaller size means it is much more difficult to reach the necessary pressure without straining away for hours. However, when you’re on the road or track and get a puncture, sometimes there isn’t much of an option. CO2 canisters have recently become popular as a way to quickly an easily refill your tires. While they’re useful and definitely save a lot of effort, they do have their drawbacks. They’re disposable which firstly means that they’re not that environmentally friendly. Secondly, what happens if you get two punctures on a ride? Or even three? Sure, you’d be unlucky, but you’d also be stuck and unlucky. Weight-wise, by the time you’ve packed a few canisters, you might as well have brought a mini-pump along instead. The whole point about a mini pump is that it’s mini. You don’t want to be strapping a floor pump to your top bar. You want something that can easily fit in your jersey (if you’re a racer) or your pannier or bag (if you’re a commuter). With this in mind, probably the most important thing to consider is the size and weight of your mini pump. For the fastest racers amongst us, a couple of ounces can make the difference between winning and losing. Most of the pumps listed are made from lightweight aluminum, but it is definitely worth looking at the weight of each pump and thinking whether or not the additional features might be worth an extra ounce or two. Additionally, it is worth double checking each pump’s dimensions. You want to make sure it can actually fit in your bag. To be effective, bike tires need to be pumped up to very high pressure. Obviously, always check what your tire says before you inflate it, but some road tires need more than 100 PSI. This is a lot of pressure to need in a tire. Before you make a purchase think what tires you will be using the mini pump for and what pressure they need to be inflated to. Then check that the pump that you’re interested in can reach that level of pressure. Getting to a high pressure usually involves quite a lot of hard work pumping. Think about how this is going to work and how strong your upper body is. Perhaps consider buying a pump with a T-handle to make the pumping work more straightforward. Or, foot pumps often make it a lot easier to pump. Everyone knows that our leg muscles are a lot stronger than our arm muscles. That’s why a lot of pumps are feet-operated. It means you can usually put a lot more effort into pumping and therefore get a lot more air into the tire, achieving that higher PSI. The foot pumps listed all have kick-out stands which allow you to balance them while pumping. They’re definitely an option to consider as they’ll definitely get your tires re-inflated quickly. Some customers have even said that these mini foot pumps are sufficient replacements for their regular floor pumps, especially if they’re trying to save on space in a small city apartment. This being said, it’s worth considering that the foot-pumps always tend to be a little bulkier and heavier. If you’re looking for something that will attach neatly to your frame to save carrying extra things, then maybe you’d be better off looking for a hand pump. If you’ve got your floor pump at home, often riders prefer to carry the lightest and smallest pump possible. Because mini pumps are designed to be portable, it is worth considering exactly what you’ll be using it for and, as a result, how you’ll be carrying it with you on rides. If you’re a racer, then you might want to consider how it could attach to your bike frame. If you’re likely to be always carrying a bag or pannier with you then, obviously, this is less of a concern. If you are wanting to mount your mini pump, then it is worth noting which pumps come with a mount and the fixing mechanism for them. Some attach using the screws on the frame that are usually used for a bottle holder. This will give you a fairly permanent and sturdy mount that’ll very securely hold your pump on long or off-road rides. Some of the mounts listed are fixed using Velcro straps. These are generally more versatile as you don’t need to get the screwdriver out every time you want to take it off. If you use your bike for all sorts of things like commuting and pleasure riding, maybe consider Velcro. Flexible hoses on pumps can be an extremely useful feature that shouldn’t be overlooked. They often add a bit of weight to the product but can save you a lot of effort. Depending on how flexible you are, it can often be difficult to position the mini pump directly over the valve if you don’t have a flexible hose. The hose means that you can pump your tire to those high pressures even if the valve is in a slightly tricky place. This can be extremely helpful if you have reduced mobility or even if you’re just very tired from being halfway through a long bike ride! A good rule of thumb is that if you’re riding a mountain bike, then your tires will have Schrader valves. If you’re riding a road/racing bike, then they’ll probably have Presta valves. This isn’t always the case so definitely check your bike tires before you purchase a pump. All the pumps listed can be compatible with both valves, but with some, it is more difficult to change over the fitting. This is something worth bearing in mind for a couple of reasons. If you’re on a family bike ride and your kids have Schrader valves, and you have a Presta valve you might want the added flexibility of a pump that doesn’t take ten minutes to change the fitting on. Similarly, if you have a budget mountain bike and a road bike and you want a pump that’ll work for both, think about purchasing a pump that has a dual fitting. Mini pumps are essential for one thing: repairing punctures roadside. Now, it really depends on how experienced a cyclist you are, but if you’re starting out, it might be worth looking at some of the pumps that come with additional puncture repair patches. It’ll just save you some time and money buying patch kits from elsewhere. If you’re an experienced cyclist then you probably already have tons of patches, and this will be less of a consideration. When you’re buying your mini bike pump, you’ll need to think about what you’re going to specifically use it for. It really depends on how you cycle as to what you’ll need. The easiest pumping experience is definitely offered by the foot pumps, but they are usually a bit bulkier and more difficult to attach. If what you’re looking for is just an emergency pump to get you the few miles back to your house, then probably just go for something that is the most lightweight and portable. There is some really neat design features out there that means that even with a hand pump you can get a lot of pump action. 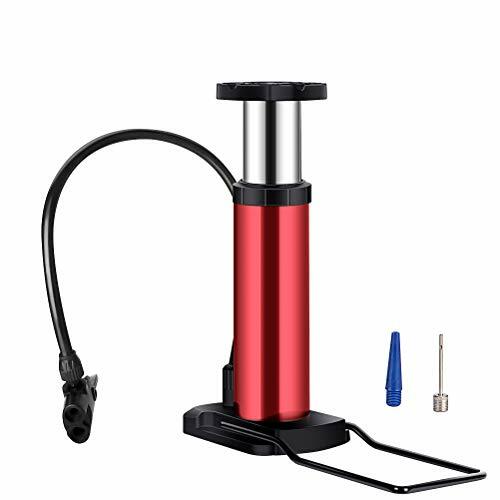 Minibike pumps are definitely something every half-serious cyclist should own, it’s just about making the decision that’s right for you.